I’ve written recently about stepping out of the shadows. I’m done with the hiding, but this work is ongoing for me. I hid for many reasons—personal, cultural, and situational reasons. Thus, to effectively discontinue the practice requires a multi-faceted approach. For another, I’m going home, remembering my stories, and believing that I belong. For another, I’m reminding myself that though I’ve struggled often, I still continue on to create and build and encourage—and I’m not even an optimist, so this must indicate the presence of hope, somewhere (within or without or despite me…). After hosting events like gallery showings I need a lot of down time to recover. (Sometimes introverts start organizations in which they are regularly obligated to be surrounded by hordes of people on a monthly basis. Also, I only call you “hordes” for a couple days after, I promise.) I like to write on my recovery days. But yesterday, as I sat down to begin picking through my thoughts and searching for the ones I could weave together into something at least somewhat cohesive, I could not quiet my mind. And so I finished a four-year project: sorting, purging, and cataloging all of my books. I have almost 600 on my shelves, and I gave away (or traded to McKay’s) almost that many more. Each book required a choice, you see, before its fate could be determined. I had to ask myself “will I read this again, did I love it, did it challenge me, does it inspire me, does it teach me, does it make me laugh” over a thousand times. Hence the somewhat lengthy turnaround time on this personal project. Still organizing shelves, but there’s so much room in here now! 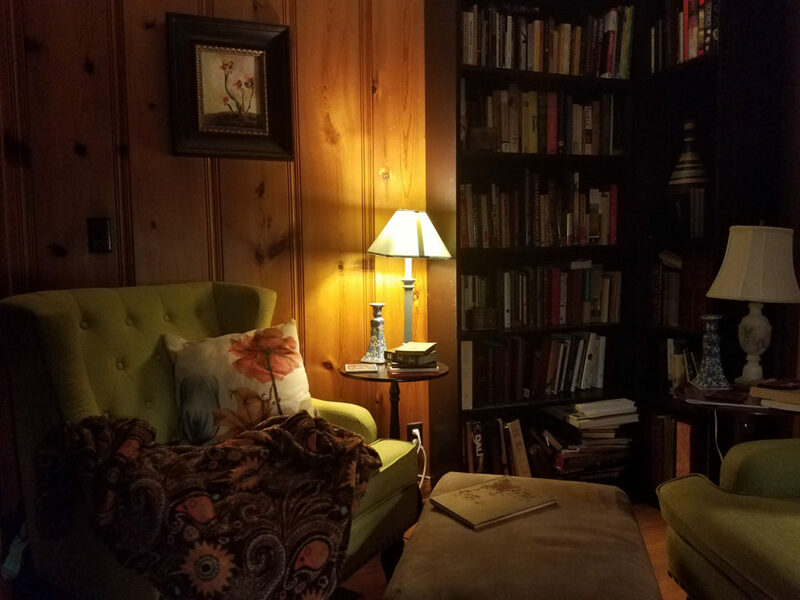 This is my reading nook in the corner. In the process of cleaning I found a sketchbook I had lost years ago. I was only four pages in to the book; I think I quit drawing after that. I say I think I quit because while I know there was a lengthy pause, the reasons for the halt of this practice are obscured in what I consider my own Dark Age… or the time in which I was sick in bed for about fifteen months over the course of two and a half years. I became increasingly weak until I set down all of my pens and pencils and gave up nearly all of my practices; I wasn’t strong enough to hold a pencil. All this to say, I don’t remember if I consciously quit, or if I just happened to forget that I used to keep trying. The first sketch in the book was for a dragon that is a character in a story I’ve been working on for longer than I prefer to think about at the moment. It was almost finished. 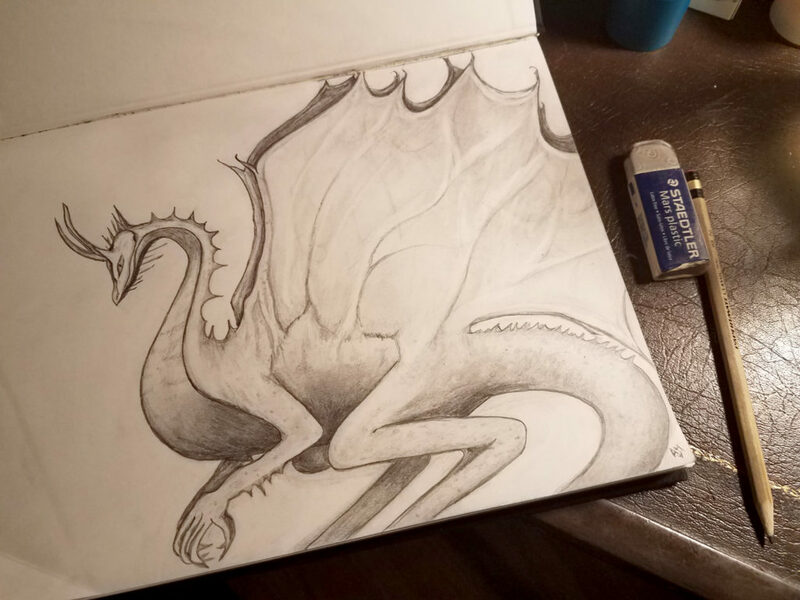 I had begun a shading process to build bat-like wings for my dragon, and there the sketch was paused for some undetermined but lengthy amount of time. I am finishing it today. On the one hand: how did I possibly forget that I used to draw daily? And on another: why does a chronically impatient person begin so many long-term tasks? And of course: why am I far more likely to complete long-term tasks than the ones in which I could actually find fairly immediate gratification? I somehow remembered exactly where I was in my process on this sketch the moment I picked up my pencil and began to complete the shading. If you’re wondering why its hands are so large, it’s because this particular breed of dragon evolved from centuries of war among its kind, and thus they developed long talons with which to tear off their enemies’ heads (as you do). I also found a notebook full of character notes which I knew I lost and had tried to recreate from memory, unsuccessfully. I wonder what else I’ve forgotten.